This entry was posted on 19th June 2010 by The Salon Look Girl. .....for Fine and Normal Hair with Organic Essence of Cranberry. Living a more environmentally conscious lifestyle is one of the biggest social trends of today. People are thinking more ecologically and taking action to practice and promote sustainability; as a result they are living healthier lives, more in-tune with the planet. Yet, they still live a modern lifestyle with latest technologies and aesthetic designs. 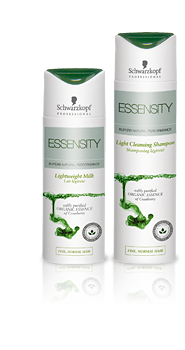 ESSENSITY is the first total approach haircare system, through colour, care & styling products, that offers a Superb Natural Performance for in-salon use and at-home maintenance. For healthy looking hair, natural shine and a velvety, beautiful touch take a look at The ESSENSITY Fine - Normal Hair sub-range that contains a daily-use product assortment to gently purify and care for your hair. These products are enriched with essences of organic Cranberry that are well known for being high in antioxidants which neutralise free radicals, reducing the damage they cause. Organic Cranberry is also an excellent source of Vitamin C.
Daily use products specially created to gently purify and care for normal to fine hair.